This post has been sponsored by Reese Specialty Foods®. All thoughts are my own. 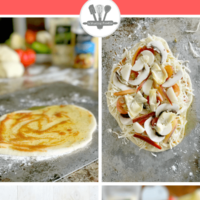 This rustic homemade pizza, loaded with yummy veggies like hearts of palm, sweet peppers, tender small artichoke hearts, and fresh tomatoes, is the perfect summer dinner! We have homemade pizza a few times a month for dinner. It’s so simple to make, especially when I take the time to prep dough ahead and have a few extra rounds leftover and stored in the fridge or freezer. Just pull out one (or a few), add sauce, cheese and toppings, and we’re good to go … even on a busy weeknight. To keep things simple, we do individual pizzas so that each person can have the toppings of their choice. Or no toppings at all. My husband and son are pizza purists, typically enjoying their pies cheese-only. My daughter and I, however, loooooove loading our pizzas up with toppings—especially vegetables, everything from fresh tomatoes to green peppers. It’s fun figuring out how we’re going to top our dough before it goes into the oven, and prepping pizzas together is a fun and low-key way to take a few minutes to chat about what’s going on in life—things like school, friends, or a TV show. That’s why the kitchen is the heart of the home. Pizza’s also a great way to introduce new and different foods like hearts of palm or mushrooms. Even though my children are both pretty daring with trying new vegetables, they still hesitate here and there with unfamiliar textures and tastes. But, it’s so much easier to get a buy-in when the veggies are mixed in with melty cheese. It’s the middle of July and the tomatoes and peppers in our gardens have begun to ripen. This rustic homemade pizza seems like the perfect way to showcase them, as well as tender small artichoke hearts and tangy hearts of palm—rich in potassium and containing Vitamin C.
Try Reese Hearts of Palm and Artichoke Hearts! Download the Ibotta app to earn rebates on Reese products, and visit ReeseSpecialtyFoods.com for the product locator and a store near you. This rustic homemade pizza, loaded with yummy veggies like hearts of palm, sweet peppers, tender small artichoke hearts, fresh tomatoes, is the perfect dinner for summer! Place a pizza stone in the oven and preheat it to 500°F. Meanwhile, roll out the pizza dough on a floured counter until it's about 1/4" thick. Transfer it to a floured pizza peel (or use cornmeal) and then top with olive oil, sauce, salt and pepper, cheese and all the remaining toppings except the basil. When the oven's preheated, slide the pizza onto the stone and let it cook for 5 minutes. If the dough appears to be sticking to the peel, use a metal scraper to gently slide it off and onto the stone. Once the pizza is cooked and the cheese is bubbly, use a wooden spoon to slide it onto a plate or cutting board. Sprinkle with basil and enjoy! This post was sponsored by Reese Specialty Foods. All thoughts are my own.